Great Southwest Adventures is Santa Fe's most experienced regional tour company, serving individuals and groups since 1998. We offer day trips from Santa Fe. Visit our Half Day Tours around Santa Fe page and our Full Day Trips from Santa Fe page. 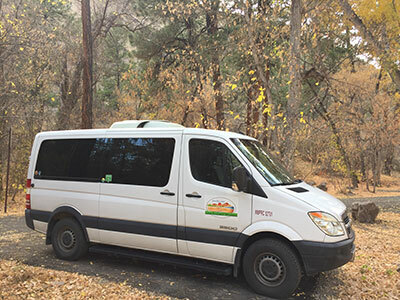 Our most popular day trips are our Taos tour, our Bandelier tour and our Georgia O'Keeffe Country (Abiquiu) tour. We pick you up at your hotel and give you a fun quality experience. We base our trips on well presented accurate information based on years of study and experience. Our top priority is your safety and your enjoyment. We also offer half day trips to accommodate shorter schedules. We know how to have fun. We love this place and we listen and learn with you. For all our tours, please call or e-mail as far in advance as you are able. Tours go once we have a minimum number of people. Private tours can be arranged for any sized group. Trips include transportation, guide, entrance fees, water and snacks. Great Southwest Adventures is fully permitted and insured for your protection. We maintain full permits with the State of New Mexico, the National Park Service and all agencies and sites we visit. We maintain full insurance for you while in the vehicle and out.